You will learn much cooking with Shirley. Alton Brown knows this! A wonderful reference, with fool-proof recipes. I love the recipe for flaky pastry. I go back to it again and again. I'm not sure where the graham crackers are in this recipe? I think they're from a different crust recipe? Edible but not good enough for the work involved. Topping was tasty but pasty! Best broccoli salad ever! I was surprised by the raw broccoli, but it went over really well, every one of us loved it.. I didn't have bacon and added the raisins early as they were hard. Worked very very well. Once you get over your first reaction (What, RAW broccoli?) this salad is very good. The flavors combine very well. When I make this again, I will add the bacon and raisins half an hour before serving so the flavors can marry even better. Excellent technique--fussy but worth it for well-flavored, tender, peel 'n eat shrimp. I doubled the amount of shrimp and increased the liquid by 2/3--a ratio I would use again. If you like very spicy shrimp you might want to increase the spice (heat) level but for a crowd, I think the spice level is just right. Fire lovers can up the heat level with a spice sauce/dip. I liked this, a different way to serve chicken. Although the recipe was adapted from an Italian one, I thought there was a Spanish feel to it. It was quite filling too. Beard Award! In the long-awaited CookWise, food sleuth Shirley Corriher tells you how and why things happen in cooking. When you know how to estimate the right amount of baking powder, you can tell by looking at the recipe that the cake is overleavened and may fall. When you know that too little liquid for the amount of chocolate in a recipe can cause the chocolate to seize and become a solid grainy mass, you can spot chocolate truffle recipes that will be a disaster. And, in both cases, you know exactly how to "fix" the recipe. Knowing how ingredients work, individually and in combination, will not only make you more aware of the cooking process, but transform you into a confident and exceptional cook -- a cook who is in control. CookWise is a different kind of cookbook. There are over 230 outstanding recipes -- from Snapper Fingers with Smoked Pepper Tartar Sauce to Chocolate Stonehenge Slabs with Cappuccino Mousse -- but here each recipe serves not only to please the palate but to demonstrate the roles of ingredients and techniques. A What This Recipe Shows section summarizes the special cooking points being demonstrated in each recipe. This little bit of science in everyday language indicates which steps or ingredients are vital and cannot be omitted without consequences. Among the recipes you'll also find some surprises. Don't be afraid of a vinaigrette prepared without vinegar or a high-egg-white, crisp pâte â choux. Many of the concepts used here are Shirley's own. Try her method of sprinkling croissant or puff pastry dough with ice water before folding to keep it soft and easy to roll. CookWise covers everything from the rise and fall of cakes, through unscrambling the powers of eggs and why red cabbage turns blue during cooking but red peppers don't, to the essential role of crystals in making fudge. Want to learn about what makes a crust flaky? Try the Big-Chunk Fresh Apple Pie in Flaky cheese Crust. Discover for yourself what brining does to poultry in Juicy Roast Chicken. 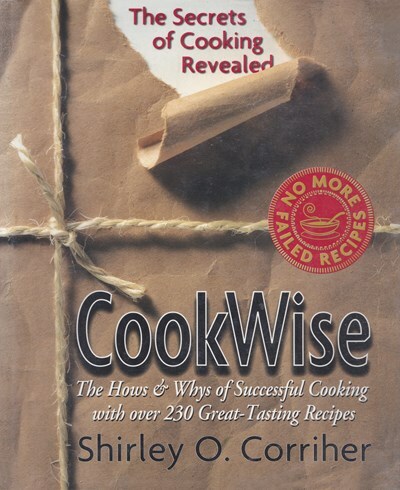 CookWise is not only informative, it's engrossing, and many sections react like a mystery story. The knowledge you gain from its pages will transform you, too, into a food sleuth, an informed and assured cook who can track down why sauces curdle or why the muffins were dry -- a cook who will never prepare a failed recipe again!